Please see the image above with the 2D face angle data - as you can see the launch angle horizontal is 0.8R, the face to target is 4.2R and the club path is 9.8L. I am right handed, 6 feet, 200 pounds. The suffix “R” in 0.8R means “right”, correct? The suffix “R” in 4.2R means “right”, correct? The suffix “L” in 9.8, means “left”, correct? Does this data mean that my ball launches to the right of the target line by angle 0.8 degree? Does this data mean that my swing path is out to in by 9.8 degrees? 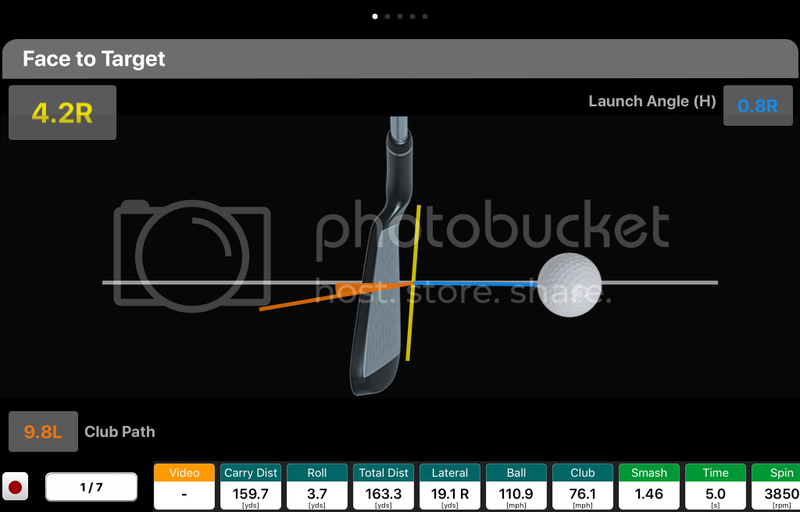 Does this data means that my club face is open at impact by an angle of 4.2 degrees? For my knowledge, what is the mathematical relationship between the horizontal launch angle with the face angle and the path angle? – is the horizontal launch angle = face angle – path angle? Last edited by Nice_Golfer; 04-18-2019 at 07:52 PM. I believe that the answers for 1-6 are all "Yes". 7 is a little more complicated, so I will let someone with more experience step up. My understanding is that horizontal launch angle is primarily ( I have heard 80% ) determined by the angle of the face when it contacts the ball. The trackman site has tons of good information and explanations. That data looks like mine, until a few months ago. I believe the common term is "wiping across the ball". Leaves lots of ballspeed and distance on the table. Yes. Assuming you are a right handed golfer, you are swinging out-to-in/over-the-top/left with a face that is open that path, which is producing a fade that is ending up (according to that data) roughly 20 yards right of your intended target line (starting line). You could gain a lot of distance by narrowing that face to path relationship down. I'm not sure what monitor/software that is, but it's showing the face is almost 5* open from the target line (as opposed to the path). So that means you have a face to path difference of 15 degrees. That's why the ball is starting right and continuing right. If you could close the face even slightly you'd start left of the target and fade back to or beyond it. All you guys are really nice and helpful. And a wonderful forum for golfers as well! Any suggestions guys on how to cure this out to in and open face swing?